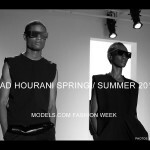 Presenting a portfolio of images from the Rad Hourani TRANSCLASSIC exhibit in Paris, all photos courtesy of Rad Hourani exclusively for models.com. Running from June 24th to July 22nd at the Joyce Gallery in Paris, designer Rad Hourani brings together the mediums of photography and video installation in his latest adventure titled TRANCLASSIC. 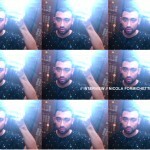 In this seemingly new guise as visual artist, he continues his craft with a passion for the androgynous aesthetic and timeless beauty of modernity incarnate. Delving into the pool of ONE Management‘s models to personify this transformable and classic beauty, individualism is expressed in ways that prove it possible to be as unique as you wish with the help of a single jacket presented 10 different ways, as well as additional key pieces amongst his latest designs. Without seasons, boundaries, or walls, Rad Hourani’s collections remain an ongoing evolution of his world’s orbit around his very own unique sun. Presenting some of fashion’s most inspiring faces in a light all his own, the designer / photographer has selected models who epitomize his ideas of personality, style, and the transcending beauty that does not reference a generation past, nor threatens expiration on a future date. Ranging from supermodel Helena Christensen and newly announced “it girl” Elisa Sednaoui, to the French classic Charlotte Di Calypso, and New Face Alicia K, the exhibit wreaks of promise and a deeper look than ever before into what can only be described as a galaxy unto itself. Inspired designs, incredible models. Bridget Hall looks fantastic! Yes! 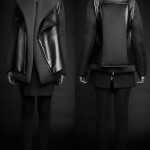 I love it it’s very chic with a futuristic edgy twist! I also made a few bags and dresses for my line. Rad Hourani, you are super talented designer/photographer/film maker/art director and i’m very inspired by everything you do because i can see your own style and passion in it. I love his minimalism. 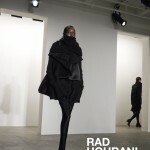 RAD HOURANI is definitely my favorite designer. he’s young, and has never been to design school! plus his models are GORGEOUS!